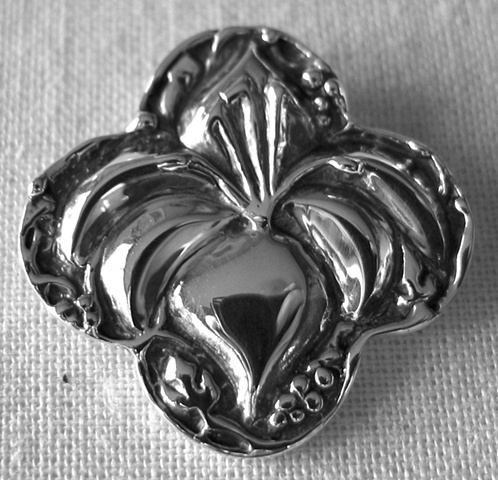 The lily is an Easter symbol of resurrection. The bulb seems to decay in the ground, until it finally grows and blooms at Easter again, releasing new life from the seemingly dead bulb. The grapevine border represents Christ who tells us, "I am the true vine, and My Father is the vinedresser...I am the vine, you are the branches." The quatrefoil is a suggestive cross form. In historic Christianity, the four lobes of the quatrefoil represent the four gospel evangelists and the four compass directions, serving as a symbol of the spread of the gospel to the ends of the earth. Four equal foils represent equal proportion, balance, harmony, and wholeness. It doesn't protrude or intrude. It fills and includes. Having no sharp external edges, it can remind us that somehow, our faith walk and that of others must co-exist compatibly, to proclaim the truths of our own tradition without hard edges or harsh boundaries.